Microcontroller is used to control the operation of various machines and devices according to the program or given instructions in the memory or ROM of the Microcontroller. The program that is needed for proper working of Microcontroller is called Firmware and is written in ROM (Read Only Memory). ROM is a non-volatile memory that is its contents are permanent. Some latest ROMs can be Re-Programmed, but mostly it doesn't requires. 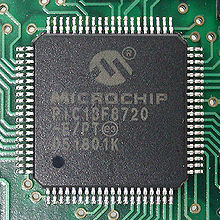 Microcontrollers are cheap and very small in size, therefore they can be embedded on any device. Programming of Microcontrollers is simple to learn. Its not much complicated. We can use simulators on Computers to see the practical results of our program. Thus we can work on a Embedded project without even buying the required Components and Chips. Thus we can virtually see the working of our project or program.